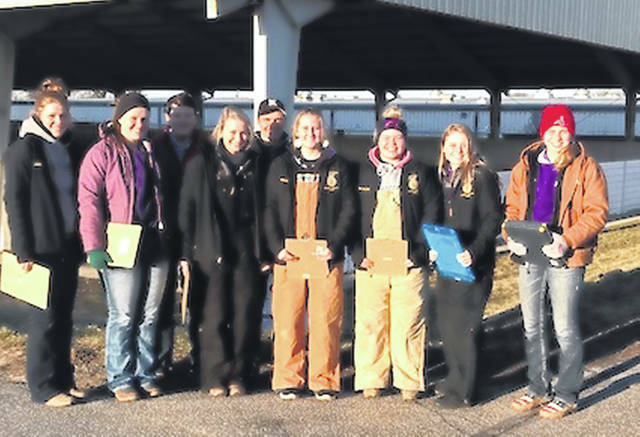 On March 23 the Mechanicsburg Livestock team won the state preliminary contest to advance to the state finals on April 26. A total of 176 teams and nearly 1,000 students competed at the state fairgrounds to judge eight classes of livestock and answer questions. A test and market grid were part of the contest. Noah Wolf, of Mechanicsburg, won the contest as an individual. The rest of the Mechanicsburg team will consist of the top scores of the contest. Grace Forrest and Jennifer Wallace will join Wolf on the team. Competing for the 4th spot will be Morgan Hamby and Morgan Heizer. Wolf, Forrest and Wallace were part of the team that won the “Big E” contest last fall in Massachusetts. The Finals will be held at the Ohio State farm facility on Sawmill Road in Columbus. The top 10 teams from the prelims will compete, as well as the top 10 individuals if not on a top 10 team. The M’burg Livestock team includes, from left, Jennifer Wallace, Morgan Hamby, Ross McNary, Morgan Heizer, Noah Wolf, Emma Violet, Hanna DeLong, Mallory Blakeman and Grace Forrest.